I like to think of quesadillas as Tex-Mex cheese on toast. They are really quick and easy to make, and taste delicious. You can add fillings such as cooked chicken, beans or pretty much anything you like. Thinly coat the bottom of a skillet or frying pan with butter. Heat to medium heaat and place one tortilla in the pan (the pan should be the same diameter as the tortilla). Generously sprinkle with cheese. When the cheese is melting, add any other fillings you are using. Lift up one edge of the tortilla and if the underside is browned and a bit bubbly, fold it over so the quesadilla is a half-moon shape. Remove it from the pan, cut it in half and serve with quacamole, dill pickles or a bit of salad. Easy! The video above is from the Keef Cooks YouTube channel. 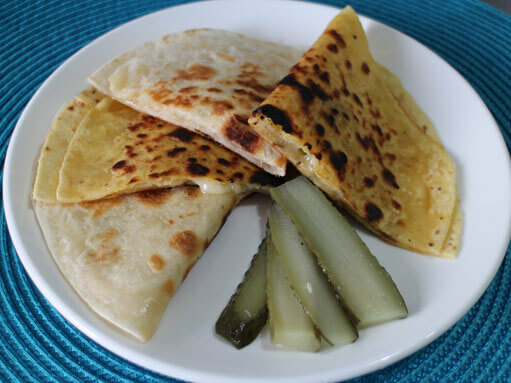 Click here to see the video recipe of Quesadillas on YouTube. A small knob of butter for frying. Any other fillings you like - leftover chicken, beans, cooked peppers etc.